Our upholstery professionals will provide outstanding services 100% of the time. We carry thousands of yards of fabric, vinyl and leather for all of your upholstery needs - or you can supply your own. We provide upholstery services in all situations - whether commercial, industrial or residential. Our services include everything from basic seat repairs to custom car show quality interiors, convertible tops, and custom subwoofer enclosures. Cigarette burns? No problem. Worn-down armrest? Simple fix. Cracked seats? Easy. 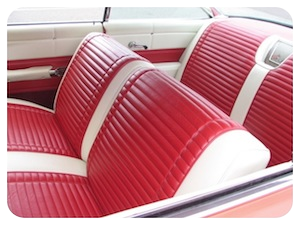 Looking to convert your seats from cloth to leather? You’re at the right place. With 30 years of professional automotive upholstery experience, there’s simply no better option! Whether recovering your furniture to enhance your décor, or bring an heirloom back to life, reupholstery, is certainly a great option. On most cases, either a piece of furniture fits just right, on a particular spot in our home, or the frame of your furniture is still in great shape, or it simply has sentimental value to you; why buy new? … When you can recover and have it back like new. With our extensive line of fabrics, there’s certainly a pattern to please you. Custom - Made Upholstery ranges from your basic sofas and chairs, to more detailed projects like accessories for your home like headboards, cornices, decorative pillows, bed wear, slip covers; the possibilities are endless. Family heirlooms are treasures. 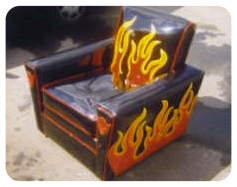 Our staff also specializes in restoration of furniture. On most restorations, all insides are replaced (i.e., springs, webbing, batting, etc. ), but still keeping the original fabric on. Our experts are masters in carefully removing the fabric, restoring, and returning your piece back to life. We also specialize in re gluing of furniture. On most cases, if required pieces are taken apart, dowels are replaced and all previous glue is cleaned, then your piece is put back together. Refinishing of furniture is now available. If you need a quote you may bring in the piece into our workroom to have it looked at or mail or e-mail a photo with dimensions for an approximate cost of the labor. There are various colors of stain to choose from to give your furniture the desired look. Slip Covering gives you freedom to choose! If you want a summer and a winter look or simply if to have the option of removing your covers, slip covering is the right answer. Oscar's attention to detail is second to none, making sure all the lines or floral patters are matched perfectly, making a real master piece out of the slip covers. We do all types of cushion replacements. The most common cushion replacement is: Foam - Wrapped in Dacron. We also offer down envelopes which is the higher end seat cushions. What is an envelope? It’s simply three cushions sewn into one. The top and bottom layers are a blend of down and feathers and the middle cushion is very soft foam. What this does is give you the comfort of down, while the middle foam insert hold its nice crisp look. Prices vary depending on the size of the cushions and also on the blend type desired. The higher the blend of down the higher the price is. Nice accents to any bedroom are headboards and cornices. We offer a large selection of shapes and sizes to better fit your décor. Headboards are an important accent of a design theme.